Highland Park and Highwood residents are actively engaged in their community and keeping them informed is our top-priority. 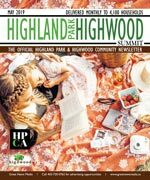 Highland Park Highwood Summit is the official community newsletter, and covers community news and is published monthly to keep content current and relevant. Delivered to every household, apartment, and business, every resident is acquainted with the community’s most important information. The Highland Park community centre is popular among many groups, including round dancers, square dancers, ballroom dancers, karate classes, various church groups and seniors groups, all of whom make use of the facilities. By combining membership with the neighboring communities of Mount Pleasant and Tuxedo Highland Park is able to offer a diversity of programs to residents. Highland Park also hosts a number of special events each year, such as the Stampede barbeque and craft fairs. The community association also acts as an advocate for residents on a variety of issues. In the City of Calgary’s 2012 municipal census, Highland Park had a population of 3,792 living in 2,123 dwellings, a 7.1% increase from its 2011 population of 3,539. With a land area of 1.4 km2 (0.54 sq mi), it had a population density of 2,710/km2 (7,020/sq mi) in 2012. Residents in this community had a median household income of $37,766 in 2000, and there were 23.9% low income residents living in the neighborhood. As of 2000, 13.7% of the residents were immigrants. A proportion of 48.7% of the buildings were condominiums or apartments, and 64% of the housing was used for renting. For more detailed info visit the City of Calgary community profiles.